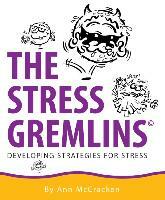 A new approach to stress is found in STRESS GREMLINS the latest book by Ann McCracken, life management consultant and stress expert. In this book Ann demystifies the word 'stress' and takes a down to earth approach to dealing with life's everyday hassles. There are lots of questions and quizzes to assist the reader in their own personal exploration. The Stress Gremlins bring a new insight to managing stress and offer a dynamic approach to tackling the challenge on a much broader, accessible scale.